AM Insulation Solutions in Collingwood was opened in 2010 to provide insulation services in Southern Georgian Bay and the surrounding areas. I have worked as an Administrator for my entire career and consider myself an optimistic person who always looks on the positive side in all situations. I have worked with AM Roofing Solutions since 2011 and enjoy dealing with customers and the challenges in the roofing industry.I look forward to speaking with you regarding any of your roofing questions and assisting in providing solutions for any issues you may encounter. 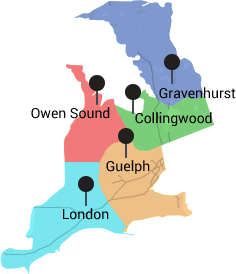 I currently reside in the Owen Sound area with my amazing wife and two great kids. I have been in the roofing industry since I was 14 years old during summers and on weekends.I started with AM Roofing Solutions in 2009 and was amazed by the company and how they respected both employees and customers. By 2012 I was made foreman and thrived on the responsibility of keeping up on quality control. It also gave me the opportunity to interact more with our customers, which is why I was thrilled when I was asked to join the AM Roofing Solutions sales team!So with over 10 years in the business and extensive roofing knowledge, ask me your questions and I will give you the answers! We at AM Roofing Solutions specialize in turning your roofing problems into roofing solutions. I was born in Owen Sound, left there when I was 17 moved out west where I resided for about 18 years in Kelowna. Then I end up doing some world travelling and moved over to England and then Portugal, Spain, China and Mexico went back to Kelowna, sold my house and wanted to move back closer to family so I move back to Owen Sound. After moving to Owen Sound I met my current wife and which now I have a three-year-old and was looking for a winning company to be a part of, where I can mix my public relations skills with my construction skills and then I found AM Roofing and I've been here ever since.Respectfully Yours. Our Collingwood office operates multiple insulation installation crews within the region. Our insulation specialists have many years of experience making our installers some of the best in the business. We install by the building code, follow manufacturer specifications, and we never take shortcuts. Installation crews always safeguard residents from project start to finish. Our Collingwood office services the Southern Georgian Bay and the surrounding areas. We specialize in attic insulation, proper ventilation and energy efficiency. We are Owens Corning’s Platinum Preferred Contractors, and we offer the best warranties in the industry.